You don’t have to be a vegetarian to love these appetizers! 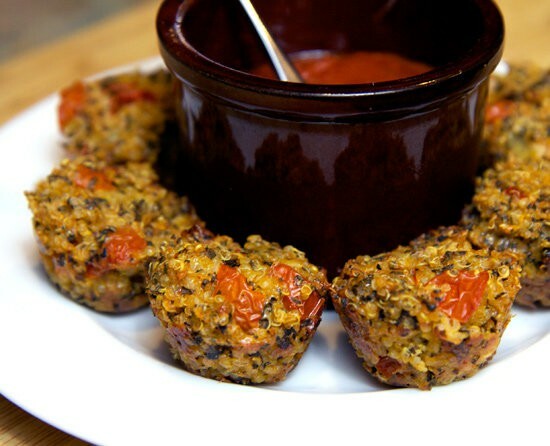 These gluten-free quinoa bites are a great nutritious appetizer that can be made for a large gathering with friends, or a more quaint dinner with your loved one. The main ingredient, quinoa, was unfamiliar to many but the interest in quinoa has increased dramatically in recent years. Quinoa is a great source of the omega-3 fatty acids (which most commonly found in plants), vitamin E, protein, magnesium and phosphorous. Most grains are considered to be inadequate protein sources – but not quinoa! Quinoa is a complete protein source that boasts many phytonutrients too! Start cooking these tasty gluten-free quinoa bites today and let me know what you think!